Marcu s Fernaldi Gideon and Kevin Sanjaya Sukamuljo are still on their throne in Hong Kong despite a significant challenge at the YONEX-SUNRISE Hong Kong Open 2018 tonight from a pair of experienced Koreans returning to the top flight. Kim Gi Jung and Lee Yong Dae – playing with a broken string – survived a marathon, 101-shot rally to clinch the first game in their Men’s Doubles quarter-final, but the Indonesian defending champions (featured image) struck back decisively in the second game and held firm in a nervy decider to prevail 20-22 21-9 21-15; the Koreans making some costly errors in the dying exchanges. “We stayed calm and didn’t panic though we knew it would not be easy. They had a solid defence,” said Gideon after advancing to the semi-finals. His partner applauded the iconic Lee, noting the 30-year-old “still has it” and “is as strong as before”. The top seeds now face their elder compatriots, Mohammad Ahsan/Hendra Setiawan, for a place in Sunday’s final. The latter beat Denmark’s Kim Astrup/Anders Skaarup Rasmussen, 21-19 21-14, to enhance their chances of qualifying for next month’s HSBC BWF World Tour Finals in Guangzhou. Fajar Alfian/Muhammad Rian Ardianto will try to make it an all-Indonesia finale when they clash with Takeshi Kamura/Keigo Sonoda of Japan in the other semi-final. Meanwhile, Women’s Doubles will see Yuki Fukushima/Sayaka Hirota continuing their qualification quest for Guangzhou. 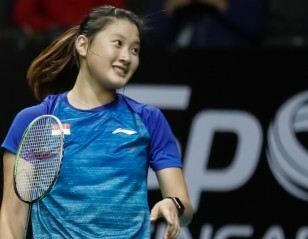 The Japanese top seeds progressed to the final four, casting aside Indonesia’s Della Destiara Haris/Rizki Amelia Pradipta (21-15 21-19). For their efforts, they will be up against another Indonesian duo, Greysia Polii/Apriyani Rahayu in the semi-finals. There is the chance of an all-Japan showdown with Shiho Tanaka/Koharu Yonemoto tackling the in-form Lee So Hee/Shin Seung Chan. The Koreans are hunting back-to-back success, having won the Fuzhou China Open 2018 last Sunday. Japan’s opportunity to secure titles by tomorrow also extends to Men’s Singles with No.1 seed Kento Momota and his team-mate Kenta Nishimoto carrying the banner for their nation. The seemingly unstoppable Momota is aiming for his fifth World Tour title this season and standing in his way in the semi-finals will be No.6 seed, Son Wan Ho. The Korean beat his compatriot, Lee Dong Keun, 21-16 21-14, in the quarter-finals. Meanwhile, Momota rolled past Jonatan Christie (22-24 21-9 21-9) after a tough first game in which the Indonesian wasted a 20-15 lead before clinching the opening honours on the seventh chance. Nishimoto will have the crowd against him when he steps on court against Hongkonger, Lee Cheuk Yiu. The local player came through a three-game test versus Sameer Verma of India (21-15 19-21 21-11). Nishimoto beat Verma’s countryman, Kidambi Srikanth (21-17 21-13). In Women’s Singles, Tai Tzu Ying of Chinese Taipei remains on track for a Hong Kong hat-trick, responding clinically after Carolina Marin captured the first game of their clash. The world No.1 appeared to lapse in concentration when leading 10-5 in the first game, her Spanish rival storming ahead at the changeover. However, 24-year-old Tai bounced back with a vengeance to take the match, 18-21 21-9 21-14. Tomorrow, it will be Nozomi Okuhara’s turn to see if she can upset Tai. 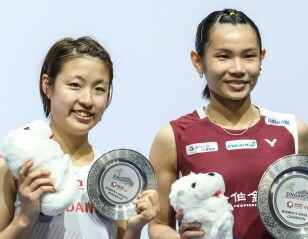 The Japanese No.7 seed progressed at the expense of Thailand’s Pornpawee Chochuwong (21-12 16-21 21-6). The Land of Smiles still has an interest in Saturday’s proceedings as Ratchanok Intanon stunned second-seeded Akane Yamaguchi in straight games, 21-9 21-16. Having endured a mediocre season by her standards, the Thai prodigy is hoping to end on a high ahead of the Guangzhou finale. “I prepared very well today. I felt I needed the right mentality and to focus throughout the match but, in the end, it was not as tough as I expected. Akane didn’t seem as confident as usual but I just focused on what I had to do,” said sixth-seeded Intanon. That player is Sung Ji Hyun who is also seeking a heartening conclusion to an average year. 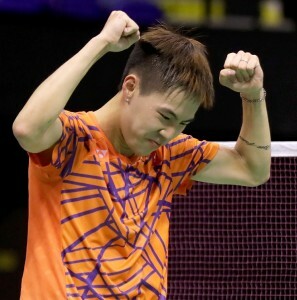 The 27-year-old Korean overwhelmed China’s He Bingjiao who retired with Sung leading 21-13 19-11. Elsewhere, Wang Yilyu/Huang Dongping are hoping to capitalise on the absence of their Chinese colleagues, Zheng Siwei/Huang Yaqiong, who have dominated Mixed Doubles. Wang/Huang will oppose Dechapol Puavaranukroh/Sapsiree Taerattanachai of Thailand in the semi-finals, having dispatched Praveen Jordan/Melati Daeva Oktavianti of Indonesia (21-14 14-21 21-14). The other spot in the final will be taken by either Japan’s Yuta Watanabe/Arisa Higashino or Lee Yang/Hsu Ya Ching of Chinese Taipei.